Right at the centre of the park is the “Central Garden”. This area is more roman in style with columns, dancing fountains and a central water feature. In the midday heat, you’ll find many people sitting in this area to cool down. Nearby is Olympic Square which acts as an arena with seating for almost 900 people. This is used for concerts, exhibitions and promotions some of the time, but is another area to sit and watch the world go by when the performances are not running. Another pretty area is the Tai Chi garden which has courtyards which are sometimes used for excercises. For a great view of the whole park, climb the 100 or so steps in the “Vantage Point” tower. The park serves as a true oasis from the hustle and bustle of the business district that surrounds it. Hong Kong Park is open daily from 6am to 11pm although some indoor facilities like the restaurant and conservatory have different opening times. Admission is free. 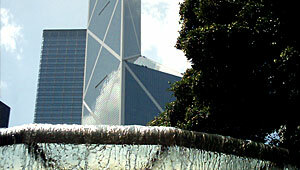 Address: Hong Kong Park, 19 Cotton Tree Drive, Central, Hong Kong.